In her second poetry collection, Susan Millar DuMars patrols the dangerous border between daylight's fragile peace and the dark reckonings of our dreams. Wait here on the lamplit shore of night. paws find purchase, yellow eyes track. Go on. Take the plunge. Susan Millar DuMars was born in Philadelphia in 1966. Her debut poetry collection, Big Pink Umbrella, was published by Salmon Poetry in 2008. Dreams for Breakfast is her second collection. Her work appears in The Best of Irish Poetry 2010 and Landing Places: Immigrant Poets in Ireland. A fiction writer as well, she published a collection of short stories, American Girls, with Lapwing in 2007, and is at work on a further story collection. Susan has been the recipient of an Arts Council Literature Bursary. She lives in Galway, where she works as a creative writing teacher. Susan and her husband, Kevin Higgins, have run Galway's Over the Edge readings series since its inception in 2003. Did I mention he wears a tux? would say, like a benediction. does not resemble my father. and somewhere, church bells ring. Our dreams teach us that we deserve more, that we should expect more from ourselves and each other. bends our branches to the ground? above my heart’s own feral sounds? While she expresses disappointment that the hoped-for romance and intimacy with her partner is a bust, she also wonders how she could possibly enjoy it with rioting in the streets. How can joy be found when people are suffering and there is injustice? You will find a way out. I was made from this. Perhaps if we believe in happiness, we will find it. ...Strongly recommended. DuMars write[s] poems that let you re-imagine yourself as the person you want and hope to be—the one who struggles but comes out whole on the other side, questioning. Always questioning. A poetry collection that opens with a poem about Belfast is bound to get my attention. Although I was born in Belfast myself, I wouldn't call myself a Belfast or Irish poet because my family moved to England, and with some countries and cities it feels as if you must stay if you want to have the right to write about the situation. Memories may make perfect subject matter for our writing, but it can be problematic knowing when we might be exploiting the suffering of others to tantalise our readers. It can be too easy to shock. Susan Millar DuMars has managed this dilemma in a masterful way in her opening poem 'Belfast, April 1941'. The approach is to look at the specific story of 'Susie Millar of Mackie Street', who has lost her husband during a bomb blast. It seems as if this is going to be a tale of terrorism, and a kind of narrative journalism, because Susie's husband is introduced 'with his pint/staring down the IRA'. However, by the time we reach the final line and hear the ˜air raid sirens, we look back to see the date - 1941 - and realise that this is the Second World War. The stories of all women who have lost their husbands to bombing merge, with terrorism and war creating the same damage to individuals. DuMars' style is to make us re-live the dust and emergence from the damaged home with Susie Millar as she blinks at the light, holding her children's hands and feeling another baby in her womb. This focus on the individual suggests so much more than is said, and DuMars never points the finger of blame. This is a book that is best read out loud to enjoy the musicality of the language. Sounds of words chime together, as do repeated phrases and themes that hold the poems together as a collection. A woman sobbing 'Paul/ Paul' during the opening bomb blast is echoed by another woman sobbing 'Paul,/ Paul' in one of the final poems. The second time this happens at a Beatles concert, with the suffering caused by love or infatuation for pop stars blending with the suffering of grief in the opening poem. The poetry of DuMars is known for its sensuality, which comes across in the concentration on detail as Dumars appeals to all of our senses with imagery we can almost taste and feel. Describing a dream to her husband in the title poem 'Dreams for Breakfast', the first-person narrator realises there's a breakdown in their understanding highlighted by the different ways their subconscious minds work. The husband says how simple his dreams of 'small men/in smaller circumstances' are compared to hers, how 'abridged' compared to the 'big budget,/Technicolour' of her imagination. In her dream a shadow has covered everything, making it all a monochrome of various shades of blue. 'If I bit the air/my mouth would fill with blue juice' she tells us. This kind of metaphor that 'lands on all four feet', as Virginia Woolf would put it, gives a thrill all of its own to the reader. We also feel the blueness of the dream reflecting the sadness the narrator feels at the distance she suddenly realises separates her from her husband. The unifying subject of the collection is dreams, but that fine line between the subconscious and the waking states of the characters are frequently so delicate that we can't tell which is being described. If you're imagining that the collection will be the usual selection of poems based on dreams you'll be surprised. At times the reader can't tell if the narrative is based on fact or fantasy. In 'Taillight' DuMars gives us the same feeling that would wake us from an unbearable nightmare as we witness a horrific scene. A child has accidentally been left behind the car as her mother drives away from a supermarket. The child has become attached to the boot and is crying out to her mother as the car leaves slowly but will soon speed up. The poem ends with DuMars recognising how the girl feels because it reminds her of dream fears, but the story itself could be completely factual and leaves the reader with a real chill. In some instances the poems bring daily events to life in a particularly realistic way. The sense of place is especially well conveyed to the reader in 'Penitents', and I recognise the Ireland of my childhood. 'The houses on Prospect Hill/kneel like penitents' DuMars tells us in another of her memorable images. In the same poem a man feels empathy with her as he says 'We are far from home /I'm Pakistani. You're from the US, yes' DuMars tells us 'He thinks he knows me' but instead she describes herself in the same terms as her Irish neighbours who have been 'picked clean' like penitents, like the very houses they live in. What's striking in this is not only the ability to describe Ireland so well, but the way DuMars conveys a feeling of having become Irish. Free verse sits easily next to more formal styles, with the themes and musical techniques unifying the whole collection. DuMars can also take us from a moment of angst to some wonderful forays into humour. For brevity I must narrow this down to just one example: 'I Dream of Stephen Fry' actually made me chuckle a few times, especially when she found that his kisses tasted of champagne. DuMars casts aside the usual interpretations of why a woman would be attracted to a gay man, then reveals something women half-know about themselves in the lines: 'somewhere there should be a place/where men with clean fingernails/who can name King Lear's daughters/look good in a tux/and have sympathetic eyes/wait to, want to, need to/kiss someone like me'. It's often enjoyable to hear the truth said with a wink. Originally from Philadelphia, DuMars now lives in Galway, and it comes as no surprise on reading her poetry to find she was included in The Best of Irish Poetry2010 and also Landing Places: Immigrant Poets in Ireland. DuMars only writes as an immigrant once in this collection, in 'Penitents', and the sense of place she conveys throughout has the feel of the writing of a native Irish poet. Dreams for Breakfast contains writing that lingers in the mind long after the book has been closed, and these are poems that the reader will want to return to. There's even a hint of faith in 'Blessingâ' and 'Make Me an Instrument' that could hint at religious belief, or may be the desire for belief from somebody without any religion in a country where this has become ambiguous for many. Any of us who have lived in another country for years will recognise the way DuMars has become like a native of her adopted country, as well as having roots in the place she left behind. Adele Ward is a British poet, publisher and blogger. 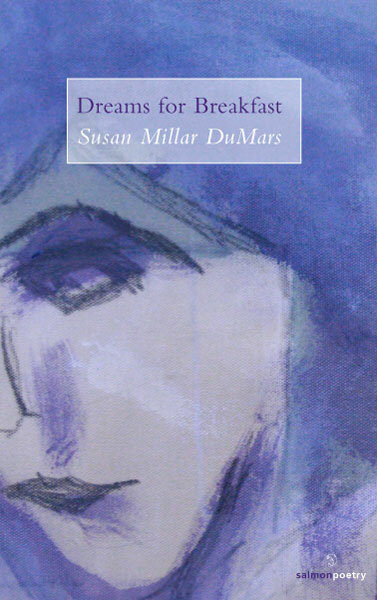 Dreams for Breakfast, Susan Millar DuMars's second collection, takes as its subject the action of the imagination. Dream and fantasy exert a shaping force here: from Albert Speer's plans for a garden to Stephen Fry in the role of idealised lover, these poems see the visionary capability as both threatening and whimsical. The best poems extend the lively wit of Big Pink Umbrella (2008), being at once direct and slow to reveal meaning. In Vacant Building, the speaker glances into pristine, empty offices: 'Nothing to see/but ourselves staring back'. DuMars is attracted to the repetition of lines, and though this strategy can be overused, it has the potential to destabilise emotional certainties with subtlety.